In this tutorial we'll be using Ionic 4, Axios and React to build a news application. We'll be making use of NewsAPI.org for getting news data and we'll be using the Axios client to send API calls to the News REST API. You need to have Node.js and NPM installed on your development machine. It's required by the create-react-app tool that will be used to generate a React project and start the local development server. As the time of this writing, create-react-app v2.1.8 will be installed. You server will be running from the http://localhost:3000/ address. Note: At the time of this writing, @ionic/react v0.0.5(beta), react-router v5.0.0 and react-router-dom v5.0.0 will be installed. At this point, you can simply import the desired Ionic 4 component and use it in your application. We'll be using the Axios client to send Ajax requests to the News REST API. As of this writing axios v0.18.0 will be installed on your project. We store the articles in the items state variable after we fetch them with Axios. 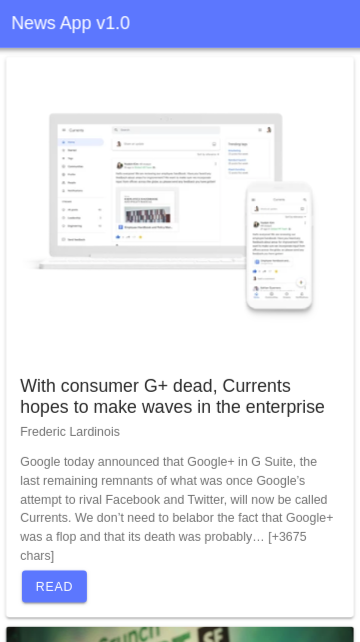 In the render() method we loop through the items state and display information related to each news article using an Ionic 4 card component. 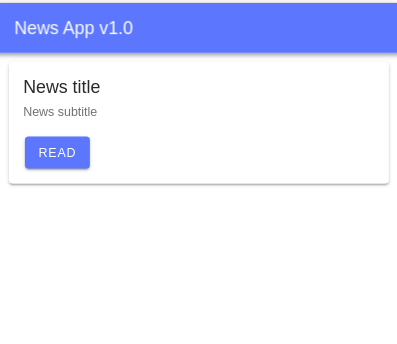 In this tutorial we used Ionic 4 with React and Axios to build a simple news application with a mobile UI. At this time, Ionic/React is still at beta, we'll be adding more tutorials later when it reaches a stable release.